As much as I like Viper Girl, I simply love Cootie, the main character in my son, Tony Saylor's, new book for kids. 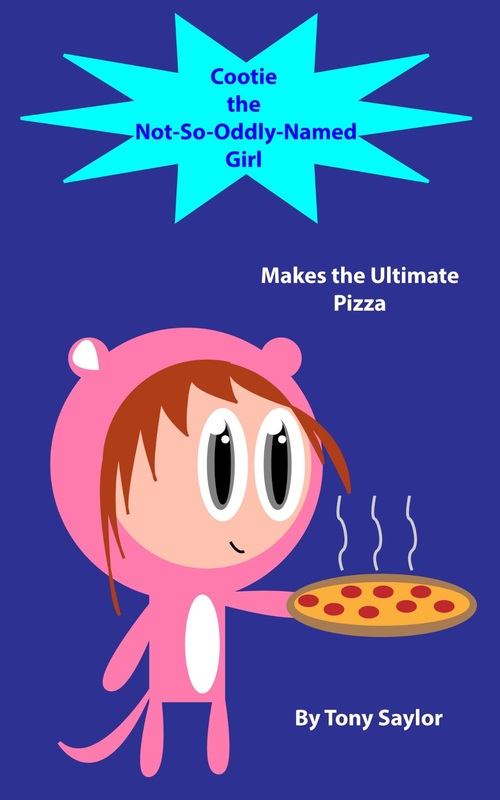 The middle grade chapter book, titled Cootie the Not-So-Oddly-Named Girl Makes the Ultimate Pizza, is available as an ebook in Kindle format, or in print. I see a bit of myself in Cootie, and I guess that's why I like her so much. She's a bit of an introvert, and although she has plenty of determination, she's somewhat unsure of herself and lacking in self-confidence. Cootie lives with and takes care of her younger, but much more assertive and confident cousin, Chortle, and as the story goes on, her grandfather also comes to stay with them. Cootie is a talented pizza chef, and her desire to make the "ultimate pizza" leads her into a wacky and exciting cooking adventure. I don't want to spoil the story, but I will say that a ninja chef and an ancient evil monster provide plenty of interesting plot twists. It's a great book for kids who enjoy quirky humor and fast-paced action. Sometime within the next week, Tony will be announcing a book giveaway on Goodreads. He is planning to give away 2 free copies of the print book. So if you participate in Goodreads, check his author page for an announcement sometime this week. You can read about the first two books Tony wrote and illustrated for children in earlier blog posts: Viper Girl vs. The Poltergeist Pirate Opossum of Plundering Peril and Viper Girl's Killer Cake and Cookie Adventure. Viper Girl's third adventure should be coming out sometime in April or May. Just a reminder, Gossamer Tangles will be participating in the Spring Artists' Market on March 10-11, 2013 at Leon and Lulu in Clawson, MI. Sales that day benefit Cass Community Services, helping the homeless in Detroit. Also, today on Art Fire, my Blue Beaded Crocheted Flower Cuff Bracelet was featured in the curated collection "Crocheted in Blue". As I mentioned in my comment on this collection, since blue is my favorite color and crochet is my favorite fiber arts technique, this collection definitely caught my fancy.